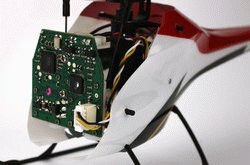 The Blade mCX2 micro coaxial RC helicopter is the next gen micro coaxial using the now, somewhat legendary, mCX platform. 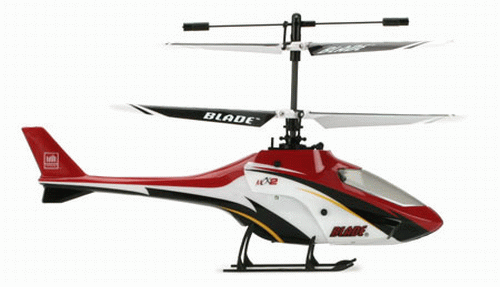 First was the original mCX which changed the micro coaxial heli industry overnight. Then came the mCX-S300 , followed by the very cool mCX Tandem Rescue . All these birds have different appeal for different people, but there is one constant they all share – the amazing easy to fly fun factor. The mCX2 is the next logical progression, adding some very nice upgrades taking cues from the very popular higher performance Blade mSR and Blade CX2. First off is the new full body style stemming from the larger Blade CX2 or looking somewhat like a F3C heli. This gives the new mCX2 a larger “presence” in the air making it look bigger than the mCX, although the dimensions are almost identical. The new body comes in two halves (a conventional front pod & the back tail section). No more little o-rings to loose like we are all use to on the base mCX & S300. The new Blade mCX2 uses small grommets, just like on the Blade mSR that stay attached to the body work – nice! This “two piece” body style not only offers easy access and removal, it allows you to remove the back half and install the optional carbon tail boom/fin (part # EFLH2428) to turn the mCX2 into a livelier pod and boom configuration. The other neat thing E-flite has done with the optional boom was to put an adjustable weight on it. This not only keeps the center of gravity correct after removing the heavier rear body work, but allows you to adjust the center of gravity to alter the flight characteristics, such as a slightly nose heavy configuration improving forward flight speed for example. I admit I am a real sucker for flashing LED’s and this is where E-flite excels in knowing their customers. 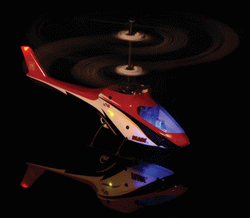 Adding green and red port and starboard flashing navigation lighting as well as a red tail light that does a pretty good job at simulating a rotating navigation beacon are the little extra details that set E-flite apart from the rest of the micro heli crowd. Let’s face it, lights don’t do anything other than add some weight and use some power - no performance enhancement whatsoever; but they look cool and add to the overall enjoyment & fun. That is after all why most of us got into this hobby in the first place – right? These LED’s are pre-fit into the back half of the body and come standard with the Blade mCX2. They plug into the new 5 in 1 control board that has a new plug input just for this purpose. You will be able to fit the new mCX2 full body (part #2427) onto your existing mXC, but you won’t be able to use the lights. Other nice upgraded details include a clear canopy window and a new rotor blade graphic that boasts the “BLADE” trade mark along with white tips (again like the Blade mSR) to give the rotors a little more appeal both when stationary and in flight. Performance wise, the Blade mCX2 has some improvements over the original mCX. First up are stronger coreless motors for a slight improvement in power. With the full body work on, this increase in power is nice to help with the slight addition in weight. In Pod & Boom configuration, there is definitely a noticeable gain in power & performance over the base mCX. To control these stronger motors as I mentioned is a new 5 in 1 control board with (I assume) modified algorithms for correct motor mixing functions. Like the rest of the mCX 5 in 1 control boards, this unit contains the DSM2 receiver, two linear servos to control the cyclic swashplate movement, a very functional yaw rate gyro , and of course the ESC circuitry to control both power and mixing to the two rotor motors. The next performance upgrade to the Blade mCX2 is another filtered down mSR component – the user selectable two position swashplate. By moving the pushrods from the inner most ball set on the swash to the outer most balls will allow more cyclic pitch angles to liven up cyclic performance as you gain skill and confidence with your mCX2. I get so many e-mails from people who want to know how to make their mCX fly faster. Well, this little trick will do it. People have been modifying their stock mCX swashplates for quite some time now. E-flite recognized this and came up with the perfect solution. It works great on the mSR and will work great on the new mCX2. In pod and boom configuration with the adjustable weight giving a little nose heavy CG will really help the mCX2 attain faster forward flight speeds if that’s what you’re after. Here's the mCX2 in action! 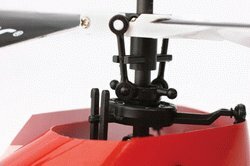 The Bind n' Fly version comes with no radio (transmitter) and like all of Blade's helicopters, can be bound to any Spektrum or JR DSM2/X radio. The Blade mCX2 is the replacement for the original Blade mCX. 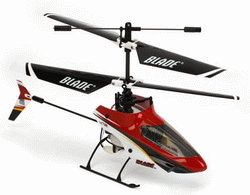 For the first time RC helicopter newbie to the advanced flyer who wants to have fun indoors when weather grounds their bigger machines, the Blade mCX2 follows the progression. The improvements in the new version are obvious – better looks, better performance, customization in two body formats, easier mounting grommets to name a few. Jim & Mark showing what this bird is all about.